We can talk about them as the hidden paradises of Istanbul - those many forests spread across different districts of the city. For nature lovers, these are the five forests you must see while here. We can talk about them as the hidden paradises of Istanbul – those many forests spread across different districts of the city. For nature lovers, these are the forests one must see while here. Yıldız Park, between Ortaköy and Beşiktaş, is home to one of Istanbul’s largest forests. The site of many celebrations during the Ottoman period, the Malta and Çadır Köşk can also be found here. With its giant stands of century-old trees, it is the ideal place for a walk or for a nice rest and a tea in one of its many cafes. Another important forest on the European side is the Emirgan Forest in Sarıyer. Given as a gift to the Iranian Emir Güne Han by the Ottoman Sultan Murad IV, in the 17th Century, over time it became known simply as Emirgan. It changed hands many times over the centuries and in the 19th century the forest came into the possession of the Egyptian Khedive İsmail Paşa. He had three köşks built on the grounds, known as the Yellow Köşk, the Pink Köşk and the White Köşk. 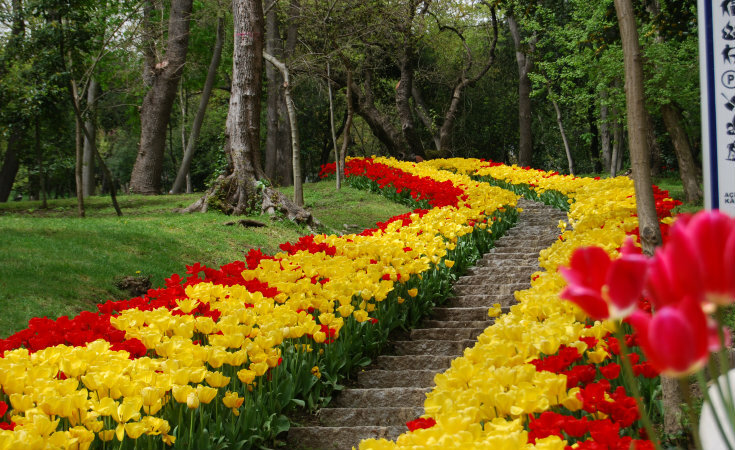 The site also hosts Istanbul’s annual Tulip Festival. The Fethi Paşa Forest, located on the Asian side of Istanbul, covers an area beginning from the north of Üsküdar and running all the way to Kuzguncuk hill. During the Tanzimat period the site belonged to the important Ottoman statesman Fethi Paşa. It is worth a visit for its wonderful sea view and the many varieties of trees found here. Located in Kanlıca, the most important feature of the Mihrabad forest is its magical view of the Bosphorus, which looks down from a hill to the Fatih Sultan Bridge and across to Rumelihisari. The forest takes its name from the Mihrabad summer palace that was once located here. Accepted as one of the important recreation spots in the area, it is the perfect place to drink tea surrounded by shady greenery while enjoying a view of the Bosphorus. Located in Çubuklu in the district of Beykoz, the Hıdiv İsmail Paşa Forest draws attention for its beautiful garden and for the summer palace built by the Ottoman Empire’s last Egyptian Vali, or” khedive” (Turkiss: hıdiv), Abbas Hilmi Paşa II. Here one can take a walk while watching the Bosphorus, take a rest in a nomad’s tent, or taste some of the local flavors.